After the last child was weaned, Jadwiga stayed in my grandmother's house to work as a maid. She even learned a little Yiddish. After about twenty years with my grandmother, Jadwiga went to Belgium, where her brother was working for the coal mines near Liege (...) She stayed there for about fifteen years, until he died. After that, she came back to our town and looked up my grandmother who sent her to my mother. I was about twelve years old, and Jadwiga must have been well into her fifties by then. Jadwiga came to my mother and said, 'Rivke, I would like to work for you.' Mother took her in. (...) She became our maid." 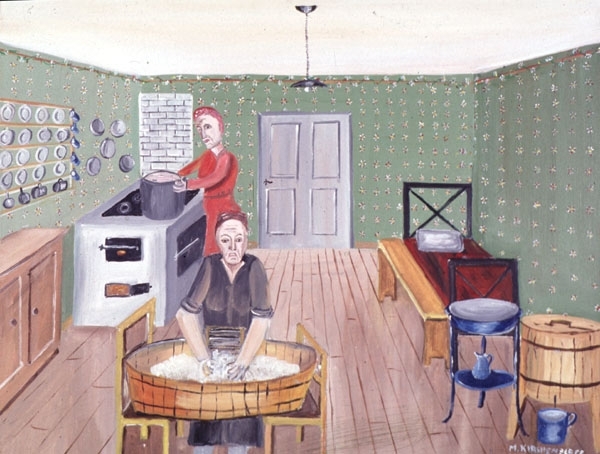 Hear Mayer talk about how laundry was done by Jadwiga in his family's home. Listen to it.